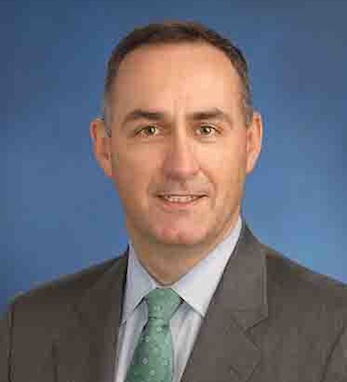 John Daly/Goldman Sachs & Co.
John Daly is co-head of the Industrial and Natural Resources (INR) Financing Group sector and head of the INR sector in Equity Capital Markets New York. He joined the firm in 1989 in Global Finance after working as a summer associate in 1988. John became a managing director in 1998 and a partner in 2000. After a three-year period in Hong Kong as co-head of Capital Markets, Asia ex-Japan, John returned to New York in his current role in late 2003. Before moving to Hong Kong, he had responsibility for Energy and Power transactions in the Equity Capital Markets (ECM) Group in New York. John worked for four years in the Corporate Finance Group within the Investment Banking Division prior to his transfer to ECM. John is a member of the Trinity College Dublin Foundation Board, the Trinity School of Business Advisory Board and the Financial Services Advisory Board of Enterprise Ireland. He earned an MBA from Wharton, a BAI in engineering, and a BA in mathematics from the University of Dublin, Trinity College. A Dublin native, John lives in New York City and is married with four children.